This week’s data includes a look at consumer prices and industrial production on Tuesday. Each is relevant given recent below trend growth in fundamental data. 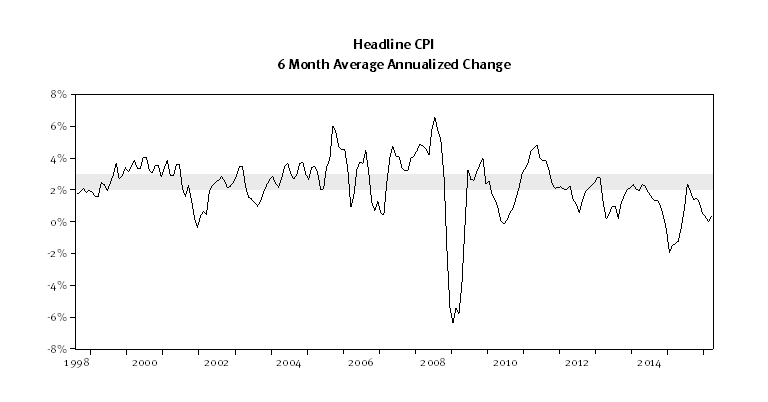 Headline consumer prices (CPI) in the last year were pressured by a sharp decline in the energy component of the index. 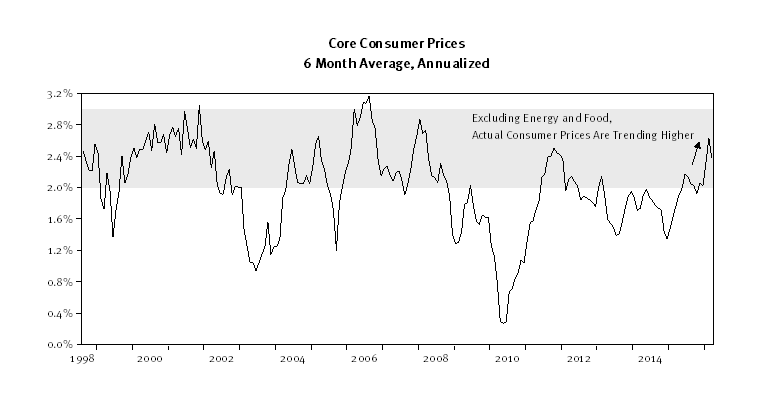 Stripping out energy (and food), core underlying inflation trends appears stronger (second chart, below). The core inflation numbers tend to be the ones emphasized most by policy makers, however. The rise in current core inflation trends stand at odds with overall inflation and future expectations for falling headline inflation (bottom chart, below). There is currently no expectation for a Federal Reserve (Fed) rate hike in June, nor is there much of an expectation for a hike through the remainder of the year (maybe another 25bps by year-end, based on futures). Still, the pickup in non-energy, core consumer prices, and increased voicing of concern by various Fed members underscores a disconnect. Last week, two Federal Reserve presidents, Boston Fed President Eric Rosengren and the Kansas City Fed’s Esther George, both commented over the need for the Fed to gradually normalize interest rates. Rosengren and George tend toward opposite spectrums of the Hawk-Dove scale, with Rosengren tending more toward the “dove” side of the spectrum (more in favor of accommodative policy). Rosengren identified improvement in the jobs market and inflation as key to normalization, while George’s comments seemed to focus on the tendency for easy money to promote cycles of disruptive overleveraging and unwinding. The Fed continues to speak for the need for removing accommodation, the bond market seems not as sure. The yield curve is the most flat since the beginning of expansion. The current spread between the 3-month T-Bill and 10-year Treasury Bond yield is 140 basis points, as the 10-year yield traded to a 1.7% yield last week. On Wednesday, we will get some more insight into what the Fed saw in assessing their April 26-27 decision on Wednesday. Beyond inflation, we will also get a look at industrial production and capacity utilization (chart below). Industrial production and GDP tend to be highly correlated (see below). Industrial production is a useful indicator for measuring economic growth because it tends to lead overall changes in GDP slightly and is available on a more frequent basis. Last month (March), industrial production fell by -0.6%. Over the last six months industrial production averaged a -0.3% monthly change. This is the worst stretch of growth for industrial production growth since the start of expansion. A positive number this week would break the trend and remove some of the concern regarding weakening growth. The consensus forecast calls for a +0.3% figure on industrial production for April and a move higher in capacity utilization. 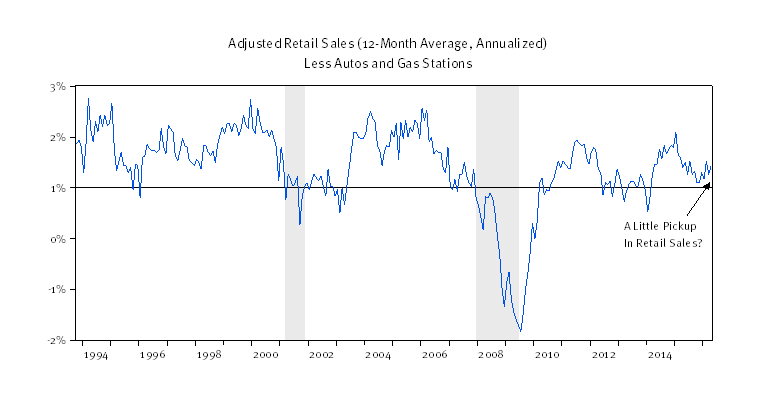 Last week’s retail sales figures surprised on the upside, providing some signs that consumers are still shopping (chart, below). Steady final demand is an important condition for a second-half pickup. While sales growth of just over 1% is not strong by historic standards, it is consistent with the slow-but-steady pace of consumption growth seen in recent years. 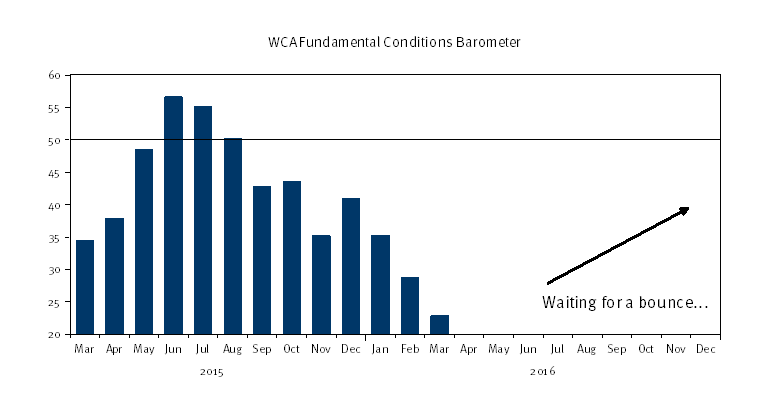 So far, the overall trends in the data are not yet pronounced enough to produce a turn in the WCA Fundamental Conditions Barometer, which weakened again through March (chart, bottom). We use this input to guide tactical allocation decisions and to guide the path of our long-run forecasts, blending near-term outlook with longer-term equilibrium expected returns. Allocations remain tilted toward bonds from stocks and blended forward-looking long run returns are skewed toward the lower end of the expectation spectrum as the result of continued weakness in data that guide our near-term outlook and sub-asset class factor model inputs. Accordingly, we’ve adjusted risk exposure down to accommodate a more uncertain environment. We assumed this posture in late 2014 and maintain a cautious posture today, in keeping with our observations and expectations.